Wandering Dragon ruse. The extra man. take part in the match. He hangs around till the match starts and then disappears. time were playing against the Dragons. This extra man is obviously 'The Dialer'. phone numbers of all the Edinburgh chess players. win a board by default under the 'Mobile rang during a game rule'. board 6 when his mobile rang. "You have just lost." and hung up. they never had a board 6 player. made a move so therefore he was not technically playing. an extra man. Final Score 4-2 to the Dragons. due to a triple attack on h7. M. Chisholm v G. Harold. Lothian Ch. 2006. I found another couple of game with the same theme. 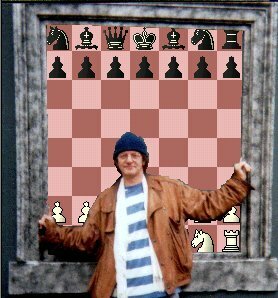 The first is Blackmar playing his famous gambit. The second is wonderfully instructive. Black snatches a very dodgy looking pawn 8...Qxd4. Then he goes for a trick that looks like it might be on, 9...Bb4+. uncorks the refutation 11 Kf1! which wins a piece. A few moves later this position appears. surely see the continuation White chose. Whites grade was 2138, black's 2084.
and resigned after move 11 Kf1! Not so J.Yanez when he as black against R.Cabrera in Lima 1997. He lost the piece in the same manner but played on. And won!